Raj Singh Rathore won the Xtreme category of the Raid in his Polaris RZR XP Turbo with a time of 26 minutes and 54 seconds. In second place was Tsering Lhakpa who finished almost 11 minutes behind Rathore, in the Polaris RZR XP 1000. Suresh Rana, who has won the Raid nine times, managed just a third place finish this time in his Maruti Suzuki Grand Vitara. The fastest participants through the course were from the Moto Quad Xtreme category with Aravind KP from TVS Racing on his RTR 450 taking first. Behind him were Nataraj R (also from TVS Racing) and Ashish Moudgil, who made his return to the Raid after a three-year sabbatical. Leg 1, which took the convoy to Manali from Shimla, measured up to around 310km and was split into four transport stages and three competitive stages. The 74km of the competitive stages were pretty tough and saw quite a number drop from the rally. After a brief halt that night at Manali, the convoy set off to Dalhousie the next morning through Leg 2. This leg of the race had two of the three competitive stages cancelled due to protests from the locals. The one stage that did run measured close to 25km through a mix of tarmac and dirt roads between two villages called Kantindri and Jatingri. While the Polarises were at home on the dirt stages, the Gypsys and Vitaras would "eat them for breakfast on tarmac," as Lhakpa had mentioned before the stage. By the end of this leg, Rana was leading with 2:14.45s on the clock, followed by Harpreet Bawa and Rathore. Leg 3 moved the racket to Jammu & Kashmir from Himachal Pradesh through Banderwah. Although there were two competitive stages scheduled for the day, only one could be accommodated and it measured close to 56km through remote and hostile regions in Himachal. Although there were no incidents during the stage itself, one of the competitors drove his Gypsy down a deep ravine during the transport stage because of what seemed like a mechanical issue. Fortunately, there were no fatalities and the participants are recovering from their injuries. After a brief halt at Srinagar, Leg 4 took the Raid to Rangdum the next day through two transport and two competitive stages that measured a total of 294km. Although the first half of this leg featured a lot of tarmac and manageable roads, the second leg, from Panikher to Rangdum really tested the participants and their machines. The 53 long kilometres between the two places were rather unforgiving and by the end of this leg, the numbers in the Xtreme category had fallen to around 40 from the initial 100 on day one, with Rana losing his lead when he rolled the car and lost close to 20 minutes. Although the previous legs were quite tough, they were simply warming the competitors up for Leg 5. The stages took the competitors from the camp at Rangdum to Padum and back through the same route. The competitive stages measured up to 92km each and the participants were allowed 70 minutes per stage to tackle the almost non-existent roads and freezing temperatures. 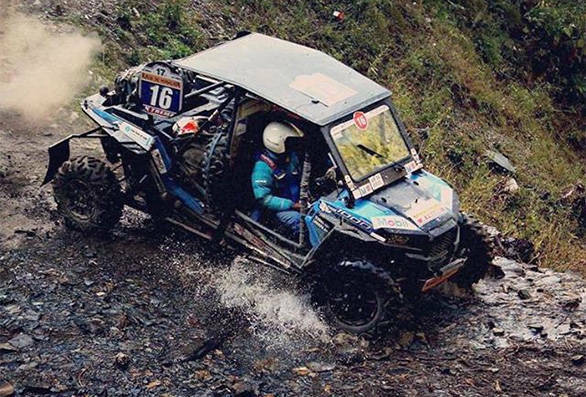 The Polarises were almost tailor-made to tackle this terrain, and this was apparent as first timers Lowis Siangshai and Sonam Wangchuk broke the stage record with a staggering 77 minutes in their RZR 1000 Turbo. The final leg of the Raid followed the same route as Leg 4, from Rangdum to Sringar. Several participants in the Moto Quad Xtreme category took quite a beating and lost time as they fell off their bikes while riding over black ice. Sarah Kashyap, made it right to the end of the Raid on her customized Royal Enfield Thunderbird despite breaking her collar bone 120km before the finish. 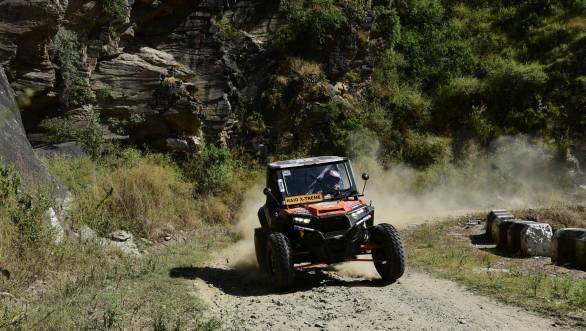 In the Adventure Trail category, Jagmeet Gill and co-driver Chandan Sen finished first while Rakesh Kumar took first place in the Moto Quad Alpine category. By the end of the Raid, the participants were just happy to have been able to finish the race without too much damage to themselves or their vehicles.